Dr. John C. Hobbins, M.D. graduated B.S. from Hamilton College, New York and obtained his M.D. degree from the New York Medical College in 1963. He completed his internship and residency in Obstetrics and Gynecology at Yale University, Yale-New Haven medical Center, Connecticut in 1968. He became associate professor in Diagnostic Radiology and Obstetrics and Gynecology at Yale in 1976 and was at the same time Directors of Obstetrics and Fetal Maternal Medicine. Dr. Hobbins was made full Professor of Obstetrics and Gynecology and Diagnostic Radiology in 1980. In August 1992 he moved to take up appointment as Professor and Chief of Obstetrics at the University of Colorado. Dr. Hobbins' contributions to the field of Obstetric sonography and the advancement of the art and science of prenatal diagnosis are unprecedented. He was one of the earliest pioneers in fetoscopy and the in-utero diagnosis of haemoglobinopathies. His classic papers on these subjects appeared in the New England Journal of Medicine as early as 1974. Working in conjunction with Yale geneticists Dr. Maurice Mahoney and Dr. Mitchell Golbus from the University of California at San Francisco, his group was the first to describe the prenatal diagnosis of Ellis-van Creveld syndrome and Duchenne's muscular dystrophy. In 1976 he published his experience on intraperitoneal transfusion under ultrasound-guidance and using a specially designed transducer. In 1977 his department (Steven Warsof et al) published one of their classic papers in fetal biometry, "Estimation of fetal weight by computer-assisted analysis of fetal dimensions" which had started the almost non-stopping search for computer-generated models of fetal weight determination in the next 10 to 15 years. His group had also published important pioneer work on ultrasound safety, fetoscopy (pioneering work in 1974), the L/S ratio, fetal lung maturity, intraperitoneal transfusion (pioneering work 1976), prenatal diagnosis of congenital anomalies particularly the skeletal dysplasias (the landmark papers appearing in 1979), fetal biometry, echocardiography, fetal monitoring, doppler ultrasound and indeed on topics covering almost the entire span of fetal sonography, prenatal diagnosis and fetal treatment. He is author or contributing author in at least 40 books and over 500 important scientific papers. His first book with Fred Winsberg in 1978: "Ultrasonography in Obstetrics and Gynecology" (Williams and Wilkins) was one of the very earliest textbooks on sonography in this specialty encompassing grey-scale and real-time imaging. Dr. Hobbins has been regarded by many of his students and colleagues as a formidable teacher and mentor. His unyielding enthusiasm, innovative perception and inspiration have affected immensely those who have worked around him. Many of the research fellows and staff that had come through his department have now become celebrated names in the field of prenatal diagnosis. (Richard Berkowitz, Frank Chervenak, Usha Chitkara, Joshua Copel, Mark Cullen, Greggory Devore, Peter Grannum, Phillipe Jeanty, Charles Kleinman, Charles Lockwood, Gianluigi Pilu, Robin Quintero, E Albert Reece, Roberto Romero and Steven Warsof, to name a few! ). Dr. Hobbins is also well-regarded as an outstanding speaker. He is always scholarly, eloquent and yet at most times entertaining. His sense of humour endears him to his audience, colleagues and patients alike. Such is also his adorable skill at the piano. Dr. Hobbins is currently Chief of Obstetrics and Director of the Prenatal Diagnosis and Genetics Center at the University of Colorado Health Science Center. 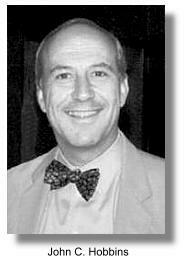 He is Fellow of the American College of Obstetrics and Gynecology and Subspecialty Certified in Maternal-Fetal medicine. He had served the American Institute of Ultrasound in Medicine (AIUM) as member of the Board of Governors and member of the Bioeffects Committee. He was president of the Institute from 1991 to 1993. He is currently Board member of the International Society of Ultrasound in Obstetrics and Gynecology (ISUOG) and is also on the editorial board of many ultrasound journals. One of his later inventions was transabdominal thin-gauge embryoscopy for direct-visualization of the first and second trimester fetuses, which he developed with Mark Cullen and E Albert Reece in 1989. Aside from the numerus awards Dr. Hobbins had received, he was presented with the Ian Donald gold medal for his outstanding contribution to ultrasound in obstetrics and Gynecology by the ISUOG in 1995. Back to History of Ultrasound in Obstetrics and Gynecology.